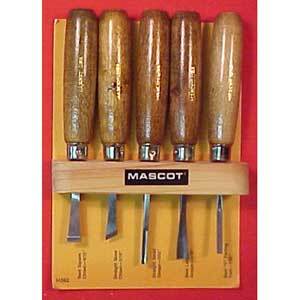 from Mascot Precision Tools. Same set as above with regular, straight handles 6". Set Includes; Bent Square Chisel 5/16", Straight Skew Chisel 5/16", Straight Small Gouge 5/32", Bent Large gouge 5/16", Bent "V" Parting Tool 5/32".